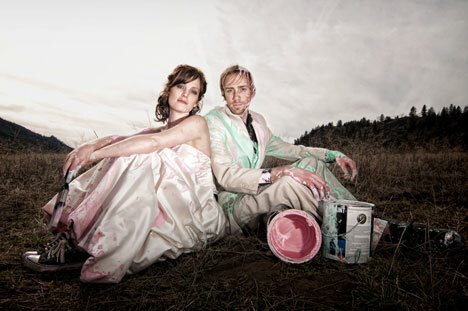 What do you get when you combine two daring, creative & fun-loving newlyweds with the (already established!) "lunatic genious" of Kyle Perison? In this case, you get one of the most incredible trash-the-dress photo shoots we have come across is a very very long time (probably, ever). The image above is only a teaser. The real fun begines in the gallery, below (personal favourite: photo #3 - AMAZING). Easily, an early photography award winner. We 're now thinking of creating a "coolest couple of 2010" award, just to credit Matt & Sara. Wow!.. There are no words to describe how amazing this session was. Matt and Sara were complete troopers with everything-even the ice cold water from the car wash. The initial plan was to do this shoot with a pure white background but they day turned out to be absolutely gorgeous so we decided to rock out at Kalamalka Park. During the paint throwing, we laid out a large amount of plastic sheeting on the ground to insure we did not destroy the Provincial Park. With a few hours of photoshop - I merged a few images together to remove the white, plastic sheeting. Turned out pretty well! THANK YOU Matt & Sara!